The Tea Party, right? Well, maybe, but the original Tea Party was the Anti-Saloon League, which managed to make prohibition -- a concept that only a vocal minority ever wanted -- into the law of the land. Burns does point out the irony that women started the prohibition movement and stoked it by attacking saloons with hatchets or blocking the doors by praying outside, but until men got involved, not much was accomplished. 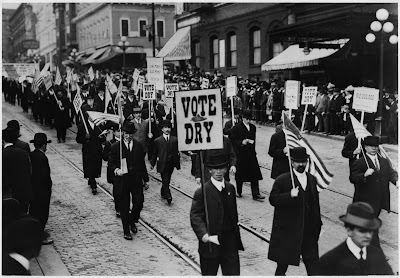 There was one bit of good from prohibition: dreaming about it got women politically organized enough to eventually get the right to vote, though the first thing they did with it turned out to be this nation's greatest political mistake. The prohibition era taught criminals to organize. It made minor crooks rich, and major crooks like Al Capone into celebrities. Burns doesn't explore how Europe must have laughed at us, but he does nicely cover the racism aspects of prohibition, namely that beer and wine were seen as the beverages of lowly immigrants. For wine geeks, the series is a mild disappointment because it says so little about wine. That's accurate enough, as prohibition started because we drank too much whiskey -- three times today's per capita consumption. And it ended even before the 18th amendment was repealed because everybody wanted to have a beer. American wine in the pre-prohibition era was mostly by and for Italian-Americans, who were considered low-class; the idea of "white people" as a race hadn't even been developed yet. And beer was controlled by German immigrants who built huge companies like Anheuser-Busch that WASPs looked askance at because they were foreigners. In fact, there's a missing link in Burns' work because we get the sense that pre-Prohibition, many Americans looked down on beer as an ethnic, low-class drink, but when President Franklin Roosevelt passed a bill legalizing it prior to full repeal, the whole country seemed to be behind him. 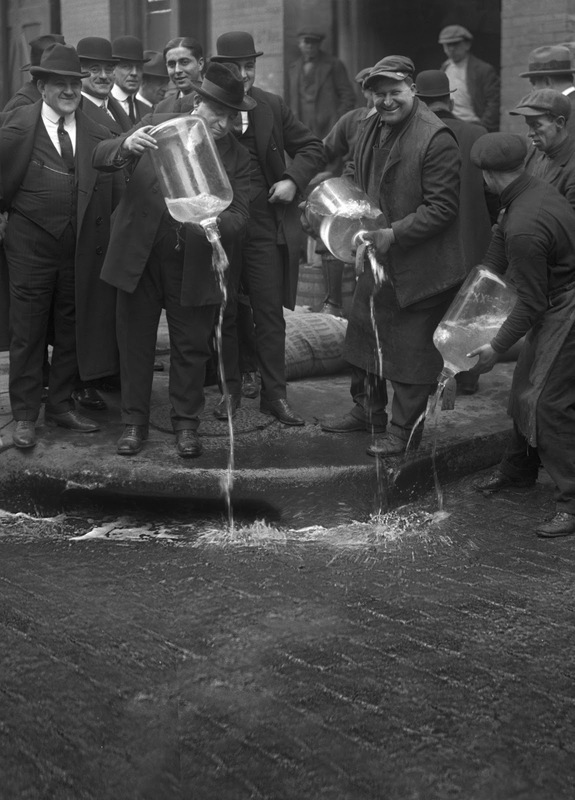 If you do start to watch "Prohibition," watch it all the way through. As with his epic "Baseball," it's fun to watch the advance of technology, from still photos to primitive films to features and finally to talkies. FDR cracking open one of the first legal beers for a delighted crowd is a highlight of the show. But please, don't be mollified by what sounds like a serious-sounding conclusion. Legislating morality isn't the problem. Powerful minorities overcoming the wishes of the majority: that's the problem. I agree with you that we should have some form of drug legalization, but I’m unsure just how it might work. You say legalizing marijuana would remove the attraction of harder drugs. Are there really people doing crack because they couldn’t legally score a joint? You’ll have to explain that one to me. One of the arguments for drug legalization (again, as a Libertarian, the concept holds appeal) parallels the prohibition experience. That is, illegal drugs lead to crime, so legalize the drugs and eliminate the market for the criminals. Sounds good, but will it really work that way? It seems to me that most drug-related crime, centers around crack cocaine and meth. I’m admittedly far removed from the drug world, but I don’t picture drug pushers in the ghetto pushing reefers to little school kids. How will legalizing marijuana stop the illegal distribution of crack and meth? (I don’t buy the “remove the attraction of harder drugs” postulate.) Don’t we need some kind of legal substitute for crack and meth (like we had commercially made whiskey to replace moonshine) to really strike a blow against the criminal drug industry? On an unrelated note: just what is the Tea Party’s single issue you are so worried about? If I were to single out one from among several, I would have to say the most important to the Tea Party types I know is smaller Federal government. Oooo…scary! Kent: You answered your own Tea Party question, though I would probably use a different way of describing it: the Tea Party stands for lower taxes for fewer services. Fair? I know we're going to disagree about whether that's as dangerous as Prohibition, but that's why the Tea Party has the sort of solid, fervent, minority support today that the Anti-Saloon League once enjoyed. Re crack and meth: They both arose in an era of harsh crackdowns on marijuana for fairly obvious reasons. Unlike a big shaggy weed, crack is compact and easy to smuggle. And meth can be manufactured locally, so it doesn't have to be smuggled. Can we put those evil genies back in the bottle by legalizing marijuana? I don't know, neither do you, neither does anybody else. But that's no reason not to try. Mexico's border violence alone is enough reason to legalize marijuana, let alone speculation on people transferring from coke and meth. Blake, The USA is not a Domocracy or a "representative democracicy". It is a republic. And in the cynical view of those like me, while in a democracy (where everyone has a say) the majority rules - but in a Republic, the shrill voices of the hysterical few dictate the status quo for all. I think that is another way of rephrasing your last point. American history illustrates how this is, in fact, the case. Blake. As for Marijuana being a "gateway drug": that is an asinine and uninformed belief. There is no choice in a "drug of choice". While all addictions share a common neurochemical pathway, the reason some people get hooked on stimulants and others prowl the streets for Oxy is that each respective substance "treats" (or palliates) an underlying condition. Yes, that is a complex view of addiction. But then, the fact that in the USA we like to parse things into easy quick tidbits and simple paradigms is emblematic of our cultures' thinking. But consider this: in cancer, we look at 5-year survival rates. In addiction treatment programs they look at sobriety at 1 year post program. A 50% sobriety rate at one year is considered a good program. It's essentially a coin toss. Blake – I think most Tea Party members would be more than willing to forego tax cuts, if they could make some headway on reducing spending. I would be happy to keep tax rates exactly where they are. As the Tea Party mantra goes, we don’t have a revenue problem, we have a spending problem. So, I repeat, the Tea Party’s number one concern, as I see it, is Federal government spending (or if you prefer, the scope and size of government). The only way the Tea Party can achieve its goals is to secure majorities in both houses, as well as the Presidency. Even then, they may not achieve much. In order to do that, they will need much more than a fervent minority. So, you’re saying people started using crack because it was tough to get marijuana? I didn’t know that. (I live a pretty sheltered life.) I didn’t know it was ever difficult to get marijuana. I didn’t mean to say that legalizing marijuana should be conditional on its ability to rid the world of crack and meth. I have no problem legalizing marijuana. I just don’t think anyone should expect it to have any impact whatever on drug crime, since it seems most drug crime has nothing to do with marijuana. It’s a completely separate problem. What about legalizing marijuana will do anything about border violence? You lost me there. Also, if you haven't read it, you should pick up a copy of "Methland" by Nick Reding. One of the most fascinating books I have read covering the history of meth in America (and a must read given your enjoyment of Breaking Bad.). I am neither arguing for or against the legalization of marijuana, but the surge in meth use in the United States stemmed from a wide-range of causes as explained in this book, much more than a crackdown on pot. SUAMW: Couldn't agree more with you on "gateway drug." Like a huge percentage of Americans, I've had-- and inhaled, and enjoyed -- marijuana. But there's no way, short of being kidnapped and having it injected into me, that I would mess around with heroin, or meth for that matter. Adam: When do you have time to read? Aren't you harvesting grapes all over two states? But seriously, thanks for the recommendation. I often say everything I know about meth I learned from "Breaking Bad" (with apologies to the author of a terrifying NYT article about dentists dealing with "meth mouth.") Sounds like good reading. I would postulate that you cannot win a moral argument. Ergo, how can you legislate morality? I agree you can pass laws, but you end up with scofflaws due to governed peoples' understanding that the government lacks the moral authority to tell them how to live. Case in point - the middle east. Why can't they just all get along? Because these peoples' have different morals and have little incentive to recognize/validate the others point of view. Provide incentive and they can find a way. Regarding underage sexual circumstances you raise, these are issues that a "moral" society will not allow its members to indulge. Discrimination is another area that the government legislates morality as can be seen in college admission selection criteria and tax payer guaranteed loans to fraudulent green energy companies. It is called picking winners and losers and the government has no business in this arena according to the Constitution. Bag tax anyone? How about re-instating the carbonated beverage tax, or the sugary foods tax? Perhaps the Constitution would make a good read. It is rich with all the moral authority we need. Blake - Politics has always been a lagging indicator of cultural change; not the other way around. The nation is moving, rapidly, toward acceptance of gay marriage. Don't expect it from the feds anytime soon. (Even Obama is opposed to it.) The nation is rapidly realizing the utter stupidity of the war on drugs, especially with regards to marijuana. Don't expect it from the feds any time soon. Go back to the Civil Rights era - it's the same story. So sure, the government legislates morality all the time. But it's always late to the party and late to responding where culture has already moved. @Adam Lee/Siduri Wines - stumbled through here last week and wanted to say that thanks to your recommdation I picked up a copy of Methland at the library. A profound eye-opener in a number of ways. Thank you.